It's that time again—for this year's Made in the 216! I am the master of working under pressure so of course I finished all of my prepping in an exhausting weekend-long stretch. I not only finished a few new pieces but also had to package and frame everything, and print/assemble a ton of business cards. 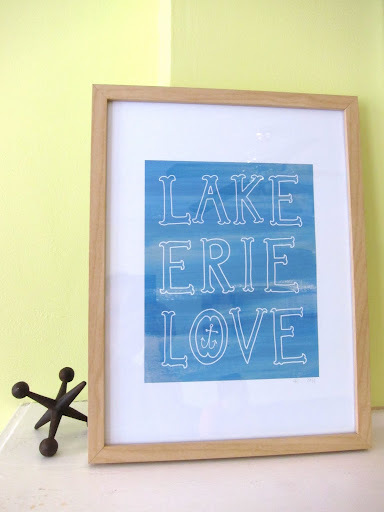 Above is a new piece and an homage to the place I call home :) You can buy it here. I made some little orange bow stickers to seal the overwrap of my unframed prints. I usually adhere my business cards to a fabric-covered backer, but in the spirit of saving time, I used different colors of washi tape to spice them up. 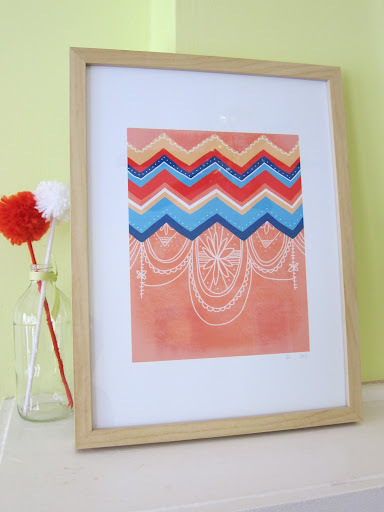 I reworked a zig-zag print I had done and framed it differently...I like this way a lot better. My bright bow in print form. You can pick it up for yourself here in my shop. The event is next weekend, July 8–10, at the newly opened Dredger's Union store downtown on East 4th. If you live here and haven't stopped in yet, RUN—don't walk—and do some shopping. The store is amazing, full of apparel and gifts and it's a visual treat. The handmade event will add another amazing element to the store. It's going to be awesome. I'll post the flier and more info as it gets closer.